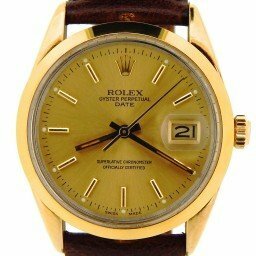 These watches are truly symbols of style and luxury. 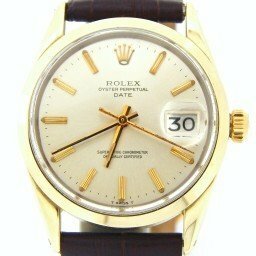 Our selection offers Rolex Date mens gold shell watches with colorful dials. You can also choose from a variety of bezels, and bands. 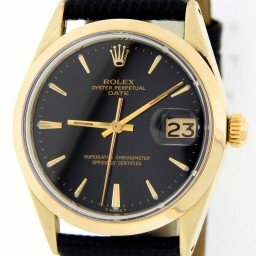 Regardless of the gold shell Rolex watch you choose, you will never be out of style wearing one.  Each purchase comes with a 30-day money-back guarantee, free U.S. shipping, and available financing. Our qualified customers also enjoy our Lifetime TradeUp Guarantee. In addition, we offer personalized customer service, as well as after-sales support. So, please contact us if we can help you find that perfect style. 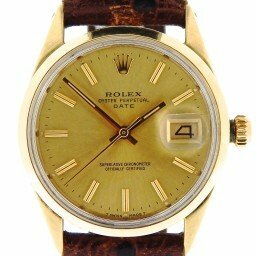 Are you in the market for a gold Rolex watch but don’t quite have the budget for it? 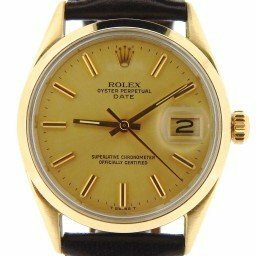 Then consider the gold shell men’s Date Rolex watch. 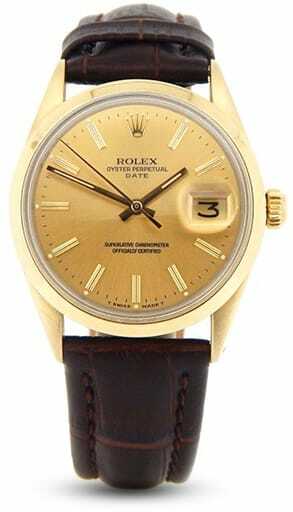 Although not built of solid gold, this vintage Rolex watch offers the look of yellow gold at an accessible price point. Let’s discover more. 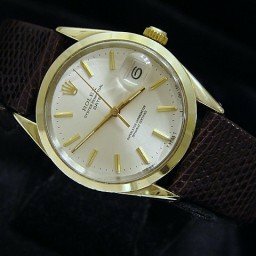 What are Rolex Gold Shell Watches? Gold shell, sometimes also referred to as gold cap or gold filled, is a technique where a thick layer of yellow gold is bonded to steel. 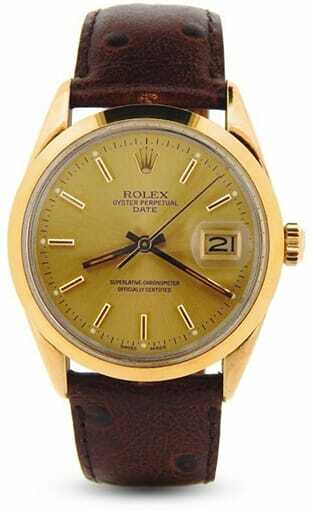 Therefore, gold shell watches offer the look of a solid yellow gold Rolex watch, but at significantly lower prices. It’s worth mentioning that gold shell is different to gold plating since it uses a much thicker layer of yellow gold. 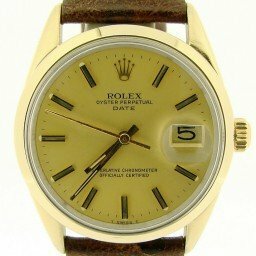 Like all other men’s Date watches, the gold shell models include a 34mm Oyster case, a date window at 3 o’clock along with the Cyclops magnification lens above it, and an automatic movement. 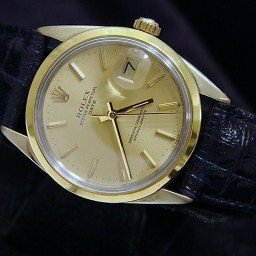 Interestingly, when using the gold shell technique, Rolex added the thick layer of yellow gold to the front of the watch but left the caseback bare to reveal its stainless steel core. 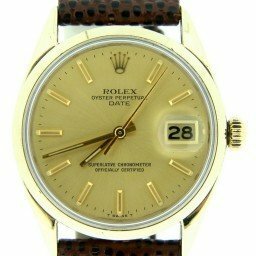 Although you can find gold shell men’s Date watches with a matching gold shell Oyster rivet style bracelets, oftentimes due to their age, they are presented on after-market custom leather straps—which looks particularly elegant. The majority of the gold shell men’s Date watches have a smooth domed bezel, but there are some examples with the engine-turned bezels too. 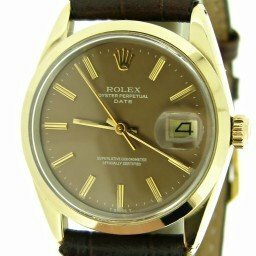 Within the Rolex Date collection, there are two generations of the gold shell men’s Date watch to consider. First, there’s the gold shell men’s Date ref. 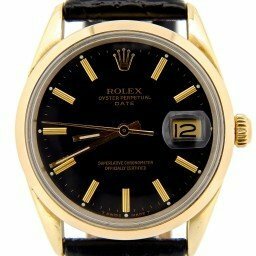 1550 from the 1960s, 1970s, and early 1980s. 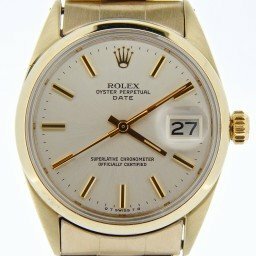 These Date watches run on non-quickset automatic movements, meaning that the date window has to be adjusted by turning the center hour and minute hands accordingly. 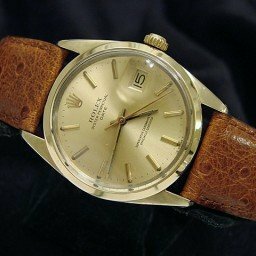 These vintage Rolex Date models also have acrylic crystals on top of their dials. 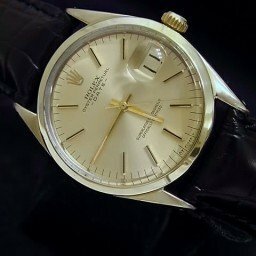 Rolex then replaced the Date ref. 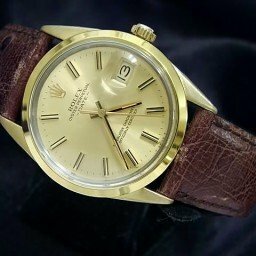 1550 with the updated gold shell men’s Date ref. 15505 in the early 1980s. This time, the watch does include the practical quickset feature, therefore allowing the wearer to set the date independently from the center time-keeping hands. They did however retain the acrylic crystals. 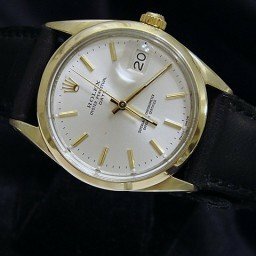 Rolex continued to produce the Date ref. 15505 until the latter part of the decade when they were eventually discontinued. 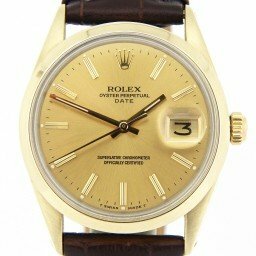 Since the men’s gold shell Date watch is a vintage Rolex model, they are of course only available in the secondary market. 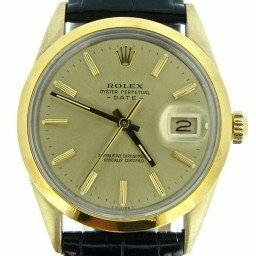 Naturally, one of the major appeals of this model is that it offers a relatively affordable way to wear a gold Rolex dress watch. 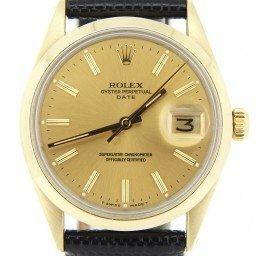 The prices for the gold shell Date watches range from $2,400 to about $3,500—which I’m sure we can all agree is a steal for a gold Rolex watch!